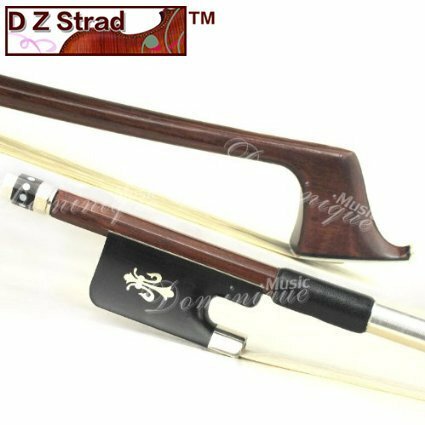 Hand made D Z Strad Cello bow. Top Brazilwood stick and highly selected horsehair. Frog is silver mounted ebony with abalone eye and slide. Button is three-part, nickel, silver. Size: 3/4. 100% handmade by one high-skill maker beginning till the end! Well air dried. Good strength and flexibility balance. Made by Pro Violin/Viola/Cello Bow work shop.Very Clean and comfortable bow! 3/4 Cello bow. Weighs about 75 g/2.6oz. "AAA" Level Mongolia Horse Hair. Wholesalers and resellers please contact us for wholesale prices. Many musical store in North America and Europe are selling our products. Get qualified violins and bows with better price directly from us (we are professional violin makers and bow makers). We also design customized violin based on your requirement. If you have any questions about this product by D Z Strad, contact us by completing and submitting the form below. If you are looking for a specif part number, please include it with your message.